So here's a recap of where we are. Rosa M Jones and Alexander H Jones were the parents of the following children. Ophelia T Jones Bryant ( Nov. 20, 1894--Feb. 20, 1939)---My great grandmother. audacity: 1. The willingness to take bold risks: "her audacity came in handy during our most recent emergency". 2. Rude or disrespectful behavior; impudence: "she had the audacity to pick up the receiver and ask me to hang up". The first thing that I thought about when I found out that my great-great grandmother Rosa Jones owned land back in 1907 was, "Where did she get the audacity to do that?" Not just one property, but several. Where did this idea..concept, mindset...whatever you want to call it come from. It didn't just come out of nowhere. Now one thing I want to mention here is that I am not trying to discredit my great-great grandfather Alexander Jones. They started this thing out together. He died however in 1915, leaving my great grandmother to carry on raising a family and renting out these lands to other African Americans of the neighborhood. I started to gleam more of where this audacity (and I am referring to definition 1. not 2.) came from when I traced further back in time to Rosa's parents. and of course my Rosa Mitchell Jones my great-great grandmother. Well this audacity came from apparently her father who purchased land back in 1878! Yup that's right 1878. The family resided in a small community about 10 miles south of New Bern called Riverdale. Here's a transcription I did of the deed. 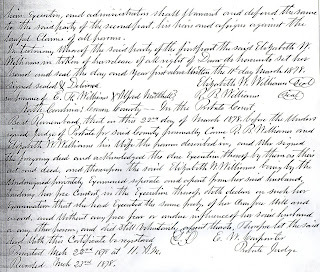 This Indenture made the first day of January in the year of our Lord One thousand Eight hundred and Seventy Eight between Elizabeth W Williams of the County of Craven and state of North Carolina of the first part, and Mortimer Mitchell of the County Craven and State of North Carolina of the Second part. 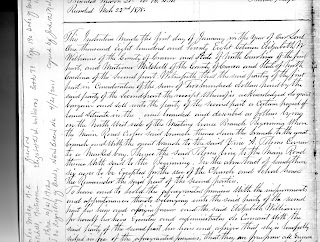 Witneseth that the said parties of the first part in Consideration of the sum of two hundred dollars paid by the said party of the Second part the receipt Whereof is acknowledged do grant bargain and sell unto the party of the second part a certain parcel of land situate in the and bounded and described as follows lying on the North West side of the Meeting house Branch Beginning Where the Main Road (crosses) said branch thence down the branch to the great branch and With the great branch to the said Vine A Tolsons Corner to a marked bay. Thence the said Tolsons live to the Main Road thence with said to the Beginning. In the above tract of land those six acres to be Excepted for the use of the Church and School house the Remainder the said part of the second parties. To have and to hold the aforegranted premises With the improvements and appointmances thereto belonging with the said party of the second part his heirs and assigns forever and the said Elizabeth Williams for herself her heirs Executors and administrators do Covenant With the said party of the second part her heirs and assigns that she is lawfully sated in fee of the aforegranted premises that they are free from all Encumbrances & that she has good right to sell and Convey the same to the said party of the second part as above said and that she will and her heirs Executers and administrators shall Warrant and defend the same to the said party of the second part, his heirs and assigns against lawful Claims all persons. In testimony Where of the said party of the first part the said Elizabeth W Williams in token of her release of all right of (unclear) do here onto set her hand and seal this day and year first above written the 11th day March 1878. Best Remembered that on this 22nd day of March 1878, before the Undersigned Judge of Probate for said County personally came R. B. Williams and Elizabeth Williams his wife the persons described in, and who signed the foregoing deed and acknowledged the due execution thereof by them as this act and deed, and thereupon the said Elizabeth W Williams being by the undersigned privately examined separate and apart from her said husband, tending her free consent in the Execution thereof, doth declare on such her examination that she had executed the same freely, of her own free will and accord, without any force fear or undue influence of her said husband or any other person, and did still voluntarily (two words that are unclear) Therefore let the said deed with this certificate be registered. Presented March 22nd 1878 at 11 a.m.
Got to get dinner on the table y'all. That's all for now. 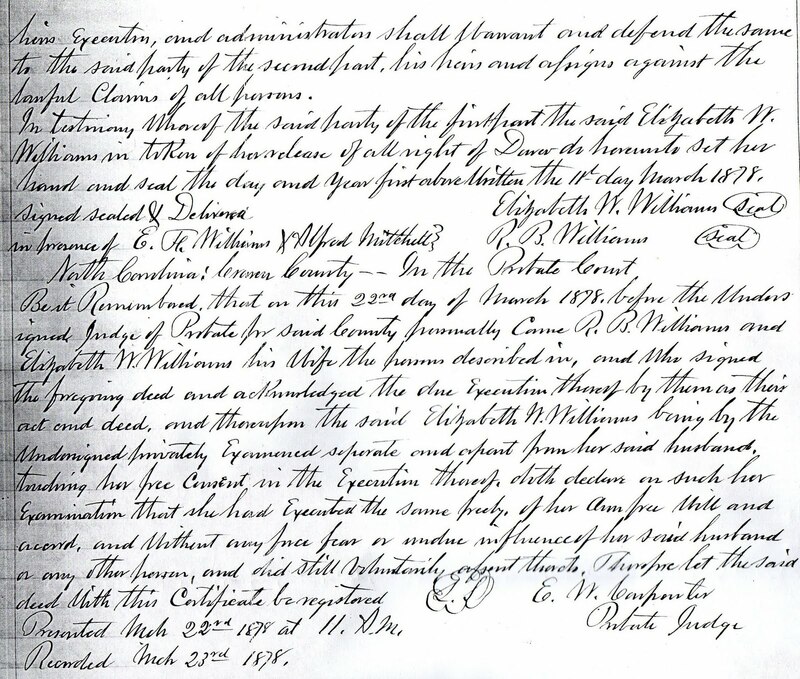 I Really like coming across land records where the woman is the deed holder. I have one where 3 sisters did a homestead together. That's awesome. 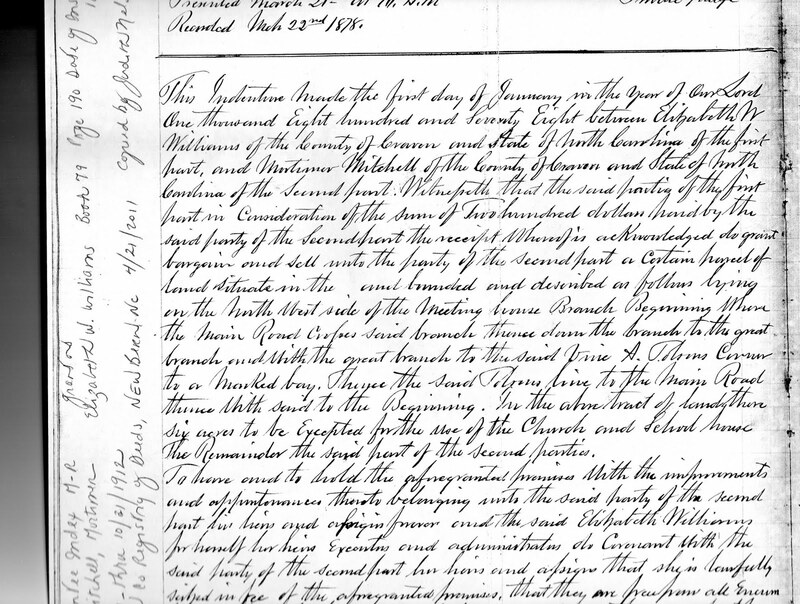 Can I tell you, I so love coming across deed information. The first deed I received for Rosa Jones was like Whoa, really, she really did own land? They are such great things to have to share with family. Thanks for your comment.